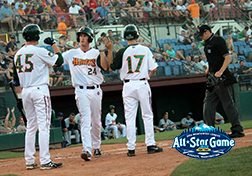 The 2013 Northwest League (NWL) All-Star team was announced yesterday, July 25, with eight of YOUR Boise Hawks gracing the roster. Out of the eight on the roster, four of them will be in the starting lineup including catcher Lance Rymel, first-baseman Jacob Rogers, second-baseman Danny Lockhart, and designated hitter Yasiel Balaguert. The other four, including outfielder Shawon Dunston Jr., utility-man David Bote, and pitchers James Pugliese and Tyler Bremer, will be on the reserve list. Rymel, a 28th round pick of the Cubs in the 2012 is hitting .307 with eight RBI on the season and is one of the top defensive catchers in the NWL. Rogers, a 40th round pick in 2012, is tied for the league lead with 27 RBI and ranks second in the league with five home runs. Lockhart, a tenth round pick of the Cubs in 2011, is hitting .311 with 16 RBI and has four three-hit games this season. Balaguert, a free agent acquisition in 2012, is hitting .265 with four homers, eight doubles, and 27 RBI. YOUR Boise Hawks coaching staff will also be participating in the game. With the Hawks winning the then East Division pennant last season, the south squad will be coached by Manager, Gary Van Tol, Hitting Coach, Bill Buckner, and Trainer, Jonathan Fierro. This will be the first NWL All-Star game since 2004. The game, presented by Tulalip Resort Casino, will take place In Everett, Washington at Everett Memorial Stadium on Tuesday, August 6. There will be other events taking place such as a Homerun Derby, All-Star Fan Fest and an All-Star Luncheon at Tulalip Resort Casino, featuring guest speaker Jack Zdurencik, General Manager of the Seattle Mariners. All-Star Tickets are available now online, in person at the AquaSox offices, located at 3802 Broadway, and over the phone at 425-258-3673. Your All-Star Game tickets include admission to the All-Star Fan Fest and Home Run Derby, as well as the game. Ticket prices are $15 for Upper Box, $17 for Field Box and $20 for Diamond Club. « Back in Boise with Eddie Orozco!